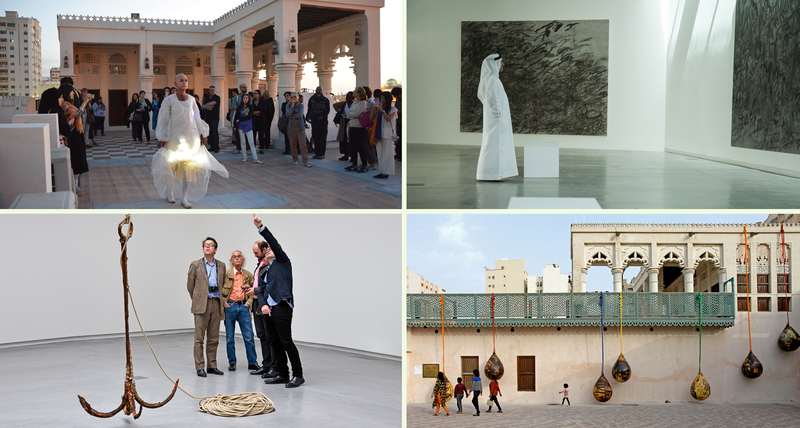 Sharjah Biennial 12: The past, the present, the possible was on view from March 5 through June 5, 2015. Sharjah is a unique place steeped in heritage and surrounded by change. With the presence of humans in the area dating back 125,000 years, this has long been a site of origin, transition and an unknowable future. Today Sharjah is part of a novel federation in the process of imagining itself along a time-space continuum unlike, but intimately linked to, that of its neighbouring nations. As the emirate’s future history is written through urban development, heritage-site restoration, interdependent transnational economies and a diverse everyday culture, Sharjah Biennial 12: The past, the present, the possible has invited fifty-one artists and groups to help us imagine and reflect upon its ambitions, possibilities and being. A biennial can be a dynamic structure for such considerations, and SB12 embraces this provisional format with a focus on timely experimentation from present and past. Mobilising a host of new commissions and works juxtaposed with an ahistorical wealth of abstraction, The past, the present, the possible signals a distrust of narrative certitude in favour of unexpected simultaneities and potential alliances. Stepping into the arena of contemporary art in Sharjah are international artists involved in numerous and varied conversations, confrontational and collaborative, formal and existential. Together their works offer both material experience and meditative pause to reassert the need for wonder, mindfulness and query at this particularly disharmonious and decadent moment in human history. March Meeting 2015 (MM2015) is part of an extended conversation that began last year with March Meeting 2014: Come Together and continues through Sharjah Biennial 12: The past, the present, the possible (SB12). For more information about March Meeting please click here. A number of publications accompanied Sharjah Biennial 12 including Sharjah Biennial 12 Catalogue (forethcoming) and Chimurenga, a pan African publication of writing, art and politics. Further information on SAF publications can be found here. A formerly abandoned ice factory located on the East Coast of the Emirate of Sharjah, Kalba Ice Factory is now a Sharjah Art Foundation permanent venue and an SB12 venue for Planetarium (2015), a major installation work by artist Adrián Villar Rojas. Built in the 1970s, the Flying Saucer was originally used as a grocery store and a restaurant and then left empty for a number of years until it became one of Sharjah Art Foundation’s permanent venues. For SB12, artist Hassan Khan presents his work in this venue in collaboration with Andeel, one of Egypt’s most well-known cartoonists. Used as temporary venues for Sharjah Biennial 12, warehouses 1 and 2 at Port Khalid displayed the works of artists Asunción Molinos Gordo and Michael Joo. Artist Uriel Barthemeli’s performance Souls’ Landscapes: The great mantle of night which has enveloped us… was also held in Port Khalid Warehouses. A site-specific installation by artist Abraham Cruzvillegas was displayed in Sharjah Bird and Animal Market as part of his ongoing project Autoconstrucción, or ‘self-building’.